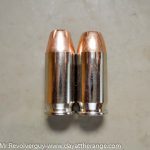 Recently I was afforded a great opportunity to experience the 45Super cartridge with the a Springfield V-16 Long Slide. I have long wondered what such an experience would be like and searched high and low for the V-16 Long Slide with not much success. Long before the days of the internet this was like searching for a unicorn, now a few pop up from time to time on the various gun auction websites but most are out of my price range. So when I found out a friend of mine had one and he so gratuitously offered it to me for a review and I jumped at the opportunity. First things first, was to get the V-16 home and make sure it was in proper working condition and to clean it up a little. 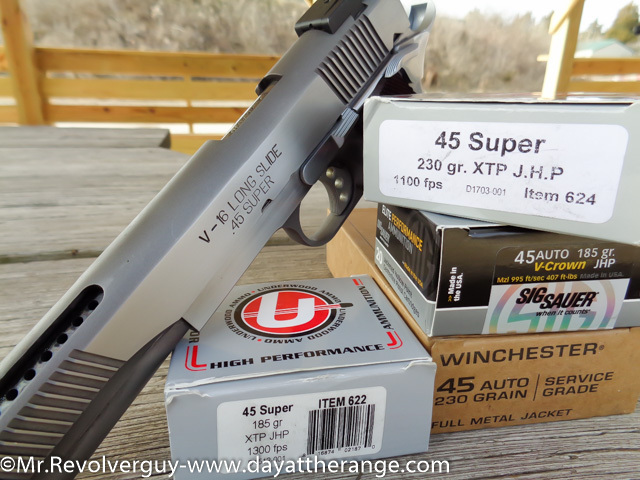 45 Super is a much higher pressure cartridge than the 45ACP and can be brutal on a standard 45ACP pistol offerings. 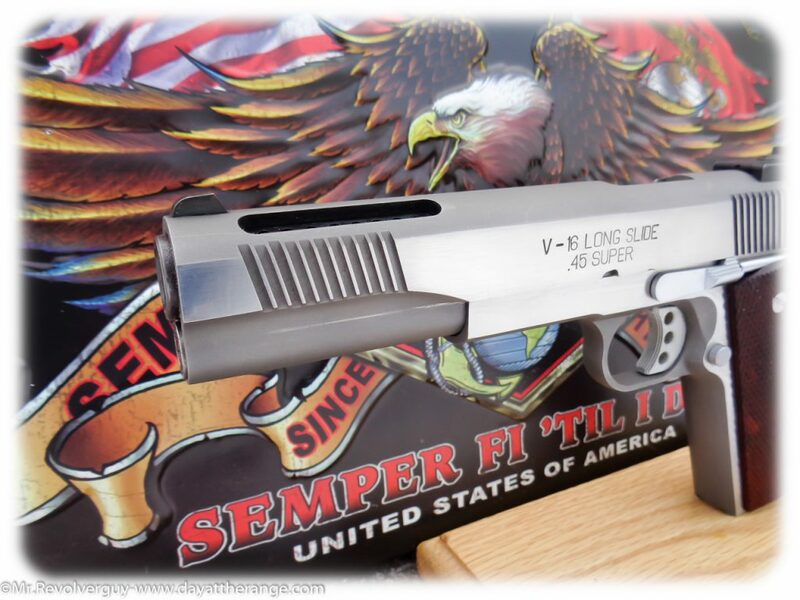 The Springfield V-16 Long Slide in 45 Super is not your standard 45ACP offering. 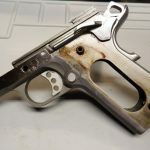 This particular pistol was manufactured in February of 2000 and though very dirty seemed to be in good working order. 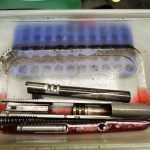 As I was waiting for my order of 45 Super ammunition to come in from Underwood Ammo I went ahead with field stripping and cleaning the beefy 1911 to better inspect the firearm. What I found was not pretty but was something easily cleaned up. The 45 Super was given birth in 1988 by Dean Grennell, with assistance from Tom Ferguson and Ace Hindman. This cartridge was intended to be the modern redesign of the 45 ACP taking advantage of modern smokeless powders, stronger brass and firearms. 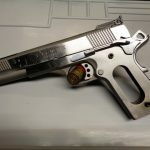 The 45 Super approaches the power of the 10MM at pressure of 28,000psi compared to the original 45ACP at 21,000 psi max pressure, however. This increased pressure, velocity and energy puts more stress on the firearm. 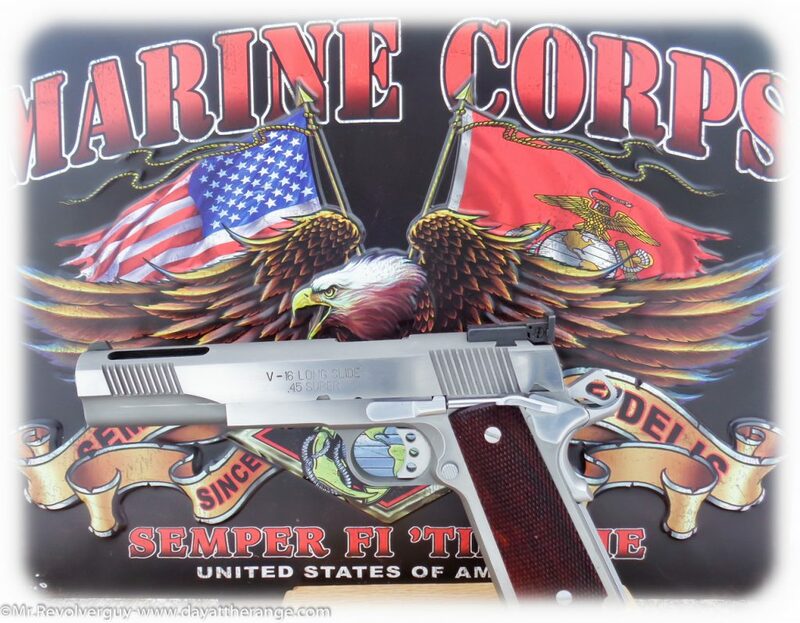 The 45ACP and 45 Super can be fired in the same pistol but I highly recommend a few changes to your traditional modern day 1911 if you decide to try this. First recommendation is to send your firearm off to a qualified gunsmith capable handling the conversion! If you decide that you plan to only fire a few hundred rounds of 45Super a year then here are my recommendations. Stronger recoil spring — This V-16 left the factory (verified directly by Springfield) with a 16lb and 18.5lb recoil spring. I would feel more comfortable if I was converting a 1911 in going with a 22lb or 24lb recoil spring for 45Super. Keep in mind for this pistol the 16lb was for firing the 45ACP and the 18.5lb was for the 45Super. The 6inch barrel, porting and mass of the slide all aide in slowing the movement of the slide preventing the frame from taking a beating. An EGW Flat firing pin stop — again this aides in slowing the down the motion of the slide. Barrel with full chamber support. Though the 45ACP and 45 Super are the same dimensions, the 45 super case has a thicker web, but a fully supported barrel adds additional safety and support to keep from blowing out cases and magazines potentially harming the shooter. Here is what Starline brass has to say about their 45 Super cases. “45 Super* is the same externally as the 45 Auto, but has a thicker web, denser grain structure in the metal, and special heat treat process that enhances the durability of the case. Similar internal capacity as the 45 Auto. Some 45 Super load data was published by Triton Cartridge before they went out of business. *Loads to be shot ONLY in guns modified professionally to handle extreme pressures of this cartridge. 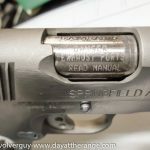 DO NOT SHOOT IN STANDARD 45 AUTO!” The Springfield V-16 sports a fully supported chamber but also relies upon the pure mass and porting of the barrel. Last but not least and often frowned upon is the Wilson shok buffer, this is an additional step which aides in preventing/slowing any frame damage. I personally only have ever used these in my 10MM 1911’s and now have installed one in this 45Super for my friend. I have never had a problem with this product when utilized in this capacity and when changed every 1000 to 1500 rounds. 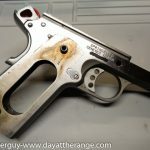 You will no doubt see many comments about this product is looking to solve a problem that doesn’t exist, I say the problem exist with 10MM and 45Super. Before heading to the range I decided to clean up the scratches on the slide and return it to the original brushed finish. Maroon and Grey automotive Scotch Brite pads make easy work of this. 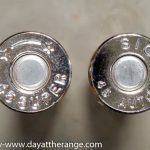 Next gather up the ammo I received and head to the range to see what kind of numbers 45Super is capable of producing. Interesting, but how is this a barrel with a supported chamber? I can only see the barrel in one picture, and it looks like a standard 1911 barrel to me, on the chamber end; no ramp with added 'meat' to support the chamber. Also, you mention in the video that the rear sight is a Bomar. While it looks like one, it's not made by this company, not is it compatible with Bomar-cut sights, because the dovetail is in the wrong place. This is an LPA-cut rear adjustable sight (still used by SA, Kimber, Remington etc). You are so right on the rear sight definitely LPA. Another minor point... toward the end of the video, you compare this to a 10mm (given that they run on similar pressures), mentioning that in your opinion, the 10mm is more versatile. I'm more than a little confused by that! 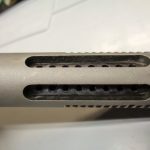 I know there are 10mm loads out there ranging from down to almost .40S&W performance, all the way up to "surely, this MUST have damaged the gun!"... but, a 1911 in .45 Super can shoot .45 Auto -- including, I assume, .45 target loads! 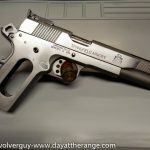 Granted, versatility in a 6" barrelled, ported 1911 is a bit academic, and it's pretty unlikely that someone who has one of these will NOT have a 'plain' 1911 in .45 Auto, so the Super's versatility probably isn't all that useful... but as an all-rounder, capable of firing some relatively cheap factory ammo (even low-end 10mm loads aren't priced anywhere near what plain-old .45 loads go for... right?) I don't think you can beat the larger caliber pistol in versatility. Thank you for sharing. Google had a lot of trouble bring up a chrono result on Winchester service grade. It isn't something too important, but like others wondered how it was compared to standard WWB or Federal AE standard ball loads.